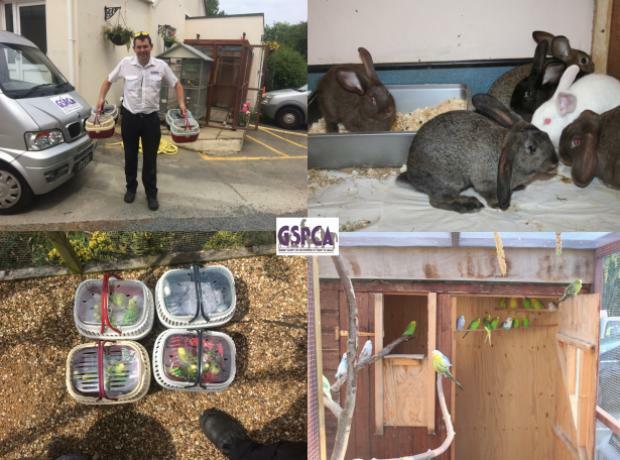 This evening three stray budgies were found near Saumarez Park which were kindly transported to the GSPCA by Leo Thomas founder of Sarnia Guinea Pig Rescue. The two male and one female birds were found together and both males are in fairly good condition, with the female bird with a few small injuries but otherwise fine. The birds have been named Major, Manuel and Sybil. We have already had a number of stray canaries and budgies found this year and sadly many are never claimed and are either rehomed or cared for at the Animal Shelter. On Friday we asked for name ideas for 19 budgies and 6 baby bunnies that were coming in to the GSPCA Animal Shelter. We decided to call the new budgies - Brandi Pansy, Carl Sweetpea, Clemantis Harding, Gary Lotus, Iris McQuillan, Isla Honeysuckle, James Jasmine, Jenny Petunia, Jess Dahlia, John Rose, Kay Camellia, Laura Carnation, Lilly Wilkinson, Poppy Cathcart, Rob Bluebell, Shuan Zinnia, Sophia Orchid, Tamara Daisy and Tulip Huston. Can you spot the theme?